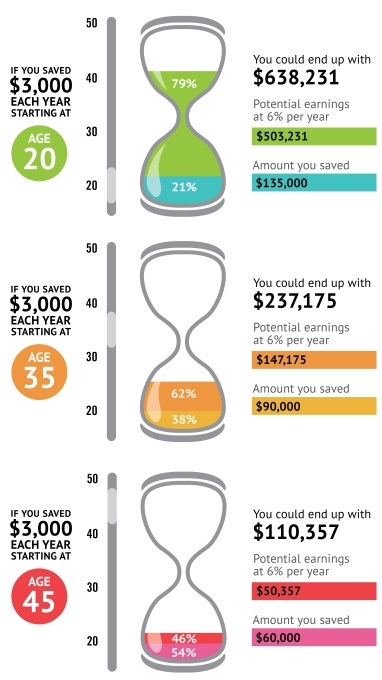 Starting to save early means your money has more time to go to work for you. Even if you can only afford to set aside small amounts, compounding earnings can make them really add up. It's never too late to begin, but as this illustration shows, the sooner you start, the less you may need to rely solely on your own savings to build your total nest egg. This illustration assumes annual investments made at the end of each year through age 65 and a 6% fixed annual rate of return. The rate of return on your actual investment portfolio will be different, and will vary over time, according to actual market performance. This is particularly true for long-term investments. It is important to note that investments offering the potential for higher rates of return also involve a higher degree of risk to principal. The examples do not take into account the impact of taxes or inflation; if they did, the amounts would have been lower. They are intended as hypothetical illustrations of mathematical principles and should not be considered financial advice. All investing involves risks, including the possible loss of principal, and there can be no guarantee that any strategy will be successful. Past performance is no guarantee of future results.